December 2014 n Performance & Hotrod Business n 27 Late Models is 300 miles away. Don't let your ego get in the way of you making money." Disterheft says it can be about timing. "Stocking products at the appropri- ate time of the season is very important to being profitable. This helps maximize cash flow by not having products sitting in inventory for extended periods. In many areas, January/February is car building or refurbishing season. So it's important to have products on the shelf that fill those needs. Spring is a great time to stock up on safety items and driver's seats. These items are normally the last thing a team purchases before going racing. Having them in stock is crucial to making the sale. "At the start of the race season, it's important to stock the products that your customers will need on a weekly basis," he continues. "Service items like oil, lubri- cants, filters, fasteners, setup tools and eas- ily damaged suspension components are great examples. As the season progresses into summer, stocking items that help the race team deal with the summer heat are important. Those items might be for engine cooling, drivetrain cooling or driver comfort and cooling." 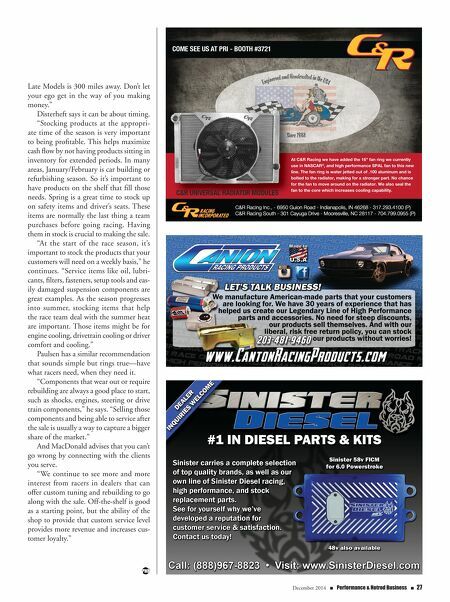 Paulsen has a similar recommendation that sounds simple but rings true—have what racers need, when they need it. "Components that wear out or require rebuilding are always a good place to start, such as shocks, engines, steering or drive train components," he says. "Selling those components and being able to service after the sale is usually a way to capture a bigger share of the market." And MacDonald advises that you can't go wrong by connecting with the clients you serve. "We continue to see more and more interest from racers in dealers that can offer custom tuning and rebuilding to go along with the sale. Off-the-shelf is good as a starting point, but the ability of the shop to provide that custom service level provides more revenue and increases cus- tomer loyalty." 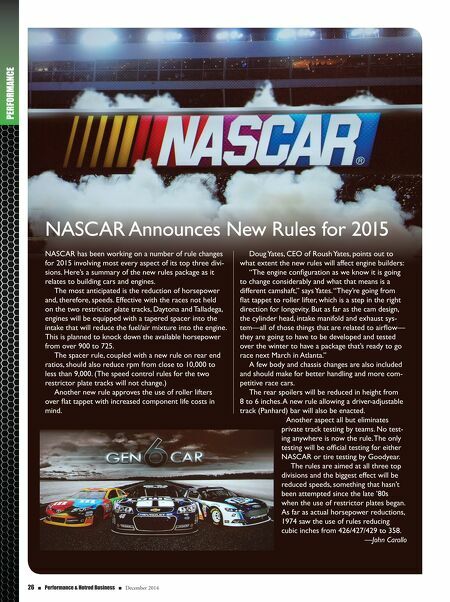 At C&R Racing we have added the 16" fan ring we currently use in NASCAR © , and high performance SPAL fan to this new line. The fan ring is water jetted out of .100 aluminum and is bolted to the radiator, making for a stronger part. No chance for the fan to move around on the radiator. We also seal the fan to the core which increases cooling capability.